Taking photos for work and pleasure for many years, Helena’s first NUJ category, when living in Paris, was in the “Photojournalist”, category, and she has always illustrated her articles and other work with her photos since. In addition to official photography done while working in the press office with the United Nations in various Peacekeeping Operations, she also took personal photographs, which are viewable in the galleries on this site. 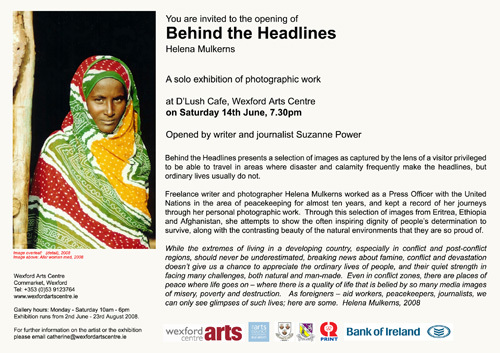 Her first exhibition, “Behind The Headlines” took place in the Wexford Arts Centre, and attempted to portray scenes from the ordinary lives of people living in conflict and post-conflict zones. The second, “Under Afghan Skies”, which took place during the Wexford Opera Festival in 2011, provided a selection of personal photographs from Afghanistan. Selections of these and other photos will be added to this website in due course. For any feedback or comments, contact me here, thanks.